This book is for anyone who has wrangled with data to try to perform automated data analysis through visualizations for themselves or their customers. This highly-customized guide is for developers who know a bit about analytics but don't know how to make use of it in the field of business intelligence. Business Intelligence (BI) is at the crux of revolutionizing enterprise. Everyone wants to minimize losses and maximize profits. Thanks to Big Data and improved methodologies to analyze data, Data Analysts and Data Scientists are increasingly using data to make informed decisions. Just knowing how to analyze data is not enough, you need to start thinking how to use data as a business asset and then perform the right analysis to build an insightful BI solution. Efficient BI strives to achieve the automation of data for ease of reporting and analysis. Through this book, you will develop the ability to think along the right lines and use more than one tool to perform analysis depending on the needs of your business. We start off by preparing you for data analytics. We then move on to teach you a range of techniques to fetch important information from various databases, which can be used to optimize your business. The book aims to provide a full end-to-end solution for an environment setup that can help you make informed business decisions and deliver efficient and automated BI solutions to any company. 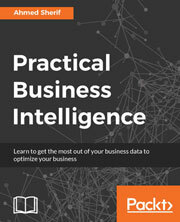 It is a complete guide for implementing Business intelligence with the help of the most powerful tools like D3.js, R, Tableau, Qlikview and Python that are available on the market. Packed with real-world examples, this pragmatic guide helps you polish your data and make informed decisions for your business. We cover both business and data analysis perspectives, blending theory and practical hands-on work so that you perceive data as a business asset.